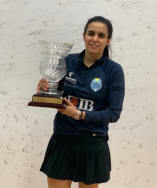 Top seed Nour El Tayeb claimed the Cleveland Classic title - her fourth title triumph in a row in the US - with a hard fought four game win over Tesni Evans. "Tesni is smarter than me. She slowed the pace and talked to the official between almost every point. I love her dearly!" No upsets on quarter-finals day in cleveland, with top seed Nour El Tayeb joined by British trio of Alison Waters, Victoria Lust and Tesni Evans in the semis. A decent day for the seeds in Cleveland with seven of the top eight winning through to the quarters, the exception being Hollie Naughton's five game win over eighth seed Nadine Shahin.